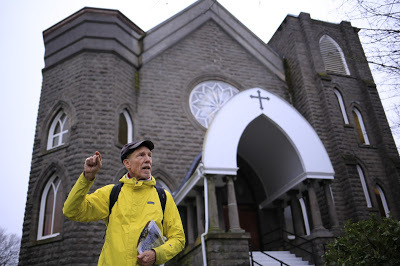 Eric Wheeler of Positively Portland Walking Tours shares Portland’s history through the stories buildings tell. As an architectural historian, Eric is both extremely knowledgeable and a talented story teller. Eric is in a sense your window to Portland’s history. While on his tours, you feel as if you’re looking back in time. A Sense of Place: I truly experienced The Pearl District for what seemed like the first time while on one of these tours. Eric guided us to five historical buildings in the neighborhood, each with its own story, history and place in contemporary Portland. While at each building, Eric pointed out historical architectural detail in contemporary spaces that I had missed before. But more importantly, he helped me experience the buildings as more than style or bricks, stones, wood or mortar. Each of the buildings was a place to savor, to inspire and to enjoy. 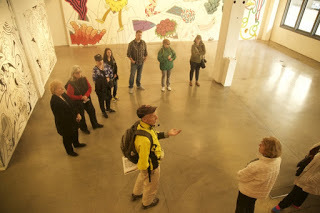 Inspiring Space: For example, we visited the Pacific Northwest College of Arts’ new Arlene and Harold Schnitzer Center for Art and Design. Located in an historic Federal building, the center was beautifully remodeled and redesigned by the award winning architect Brad Cloepfil. Before we entered the space, we admired the exterior details common to architecture of the time the building was first constructed. It was like discovering a little piece of history in the heart of the city. It was learning that Portland is not only a great city today, but also a place of profound history. Honoring History: As we stepped inside, I immediately noticed the intricate juxtaposition of history and now. Eric beautifully explained where old met new and how seamlessly they integrated. We all sensed the wonder of the place and space, each sharing our impressions of what we felt inside. It was one of the few times I’ve almost become part of a space, like when I visited the Uffizi in Florence. I was standing in a place that inspired so much, I felt the rhythm of art within me. Eric guided me there. Each site we visited was equally awe inspiring. Walking Through History: Although Positively Walking Tours run 2 to 2 1/2 hours and you might only walk a few miles, you feel like you’ve really traveled. In a way, I felt I was visiting a city for the first time, or that I was covering the markers of time. Eric is a historian at heart with the gift of narration. The Stories: Eric has an uncanny ability to bring the buildings you visit to life, telling you stories of past inhabitants and their lives and business there. You don’t even know you’re getting a history lesson. You become entranced by the story, with the building as the stage and narrator. Eric spends hours researching each site, finding the treasures hidden in its history to share. He says that each time he leads a tour, the stories vary a bit. It’s more a conversation than script. Simply Portland: Originally from the Midwest, Eric came to Portland not too long ago. He was at kind of a crossroads, and headed to the Pacific Northwest. In the true spirit of simple living, he came here with few possessions and still lives that way. Arriving in Portland as almost a stranger, he set about to find some work to do. He wanted to stay here. He loved the collegiality and spirit of the city and enjoyed the mild winters! The Meet Up: Eric started volunteering at the Portland Architectural Heritage Center and worked on a project researching and retelling the history of fraternal orders and their buildings in Portland. But, Eric remarks, everything changed when he discovered Meetup.com. He joined some tours from Uniquely Portland Walking Tours (tours exploring the whimsy of Portland) and developed a partnership of sorts with the man running those tours. Eric started guiding some of those tours and then slowly added his own style of tours. Soon, Eric started his own Meetup, Positively Portland Walking Tours. Eric is in a sense your window to Portland’s history. While on his tours, you feel as if you’re looking back in time. Eric’s History: Eric grew up near Chicago, and was a history major in college. He also later earned a Master of Arts in Teaching History, but did not fit in teaching college. Although he sees himself as a teacher, he sees history as a story to tell. He worked for several years as a real estate appraiser as well as an independent consultant for historic preservation projects. His work included preparing nominations for the National Registry of Historic Places. He arrived in Portland by way of LaCrosse Wisconsin, where he had developed 11 virtual walking tours of historical buildings there, called Footsteps of La Crosse. 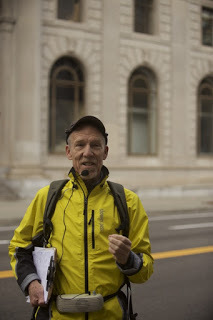 Find a Tour: Eric says there are about 50 different walking tours in his repertoire, and he’s always planning more. He offers enough tours for anyone to become an expert on this city. But I think they’re actually more than neighborhood tours. I think it’s a way to experience a neighborhood through its past, giving you a richer understanding of the place you’re in. Join Positively Portland Walking Tours on meetup.com.